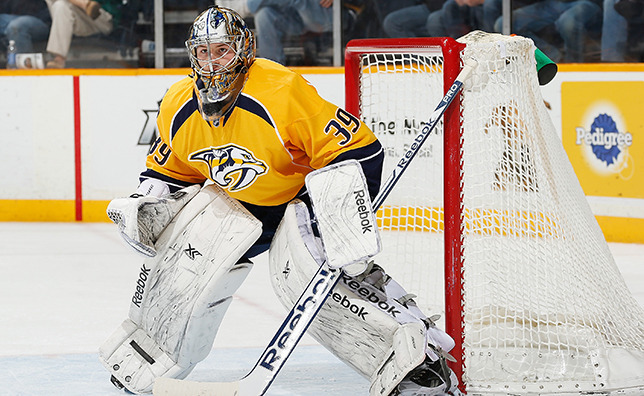 Nashville's ninth choice, 179th overall (sixth round), in the 2012 Entry Draft, played the fifth-most minutes of any rookie NHL netminder (1,369:32) in 2013-14, appearing in 25 contests for the Predators and being named the NHL's Rookie of the Month for November 2013 after going 5-4-1 with two shutouts, a 2.00 goals-against average and a .933 save percentage. The 6-4, 194-pound Mazanec also ranked second among AHL rookie goaltenders, and 10th overall, in point percentage after posting an 18-10-3 record (.629, min. 700 minutes) in 2013-14. In his final season in the Czech League in 2012-13, he led Plzen to its first title by stopping 48-of-51 shots in a Game Seven double-OT victory in the league final. He ranked fourth in 2013 playoff goals-against average (2.13) and sixth in save percentage (.932), in addition to tying for second in shutouts (2). During the 2012-13 regular season, the Pisek, Czech Republic, native ranked sixth in the Czech Extraliga in goals-against average (2.49).